Anyhow, I have went over ideas for Halloween, and got some awesome surprises for you that are family friendly, and then adult friendly as well. I’m so excited! Look out for those in two weeks. In this entry, we did an indian based dinner, that my kids loved! 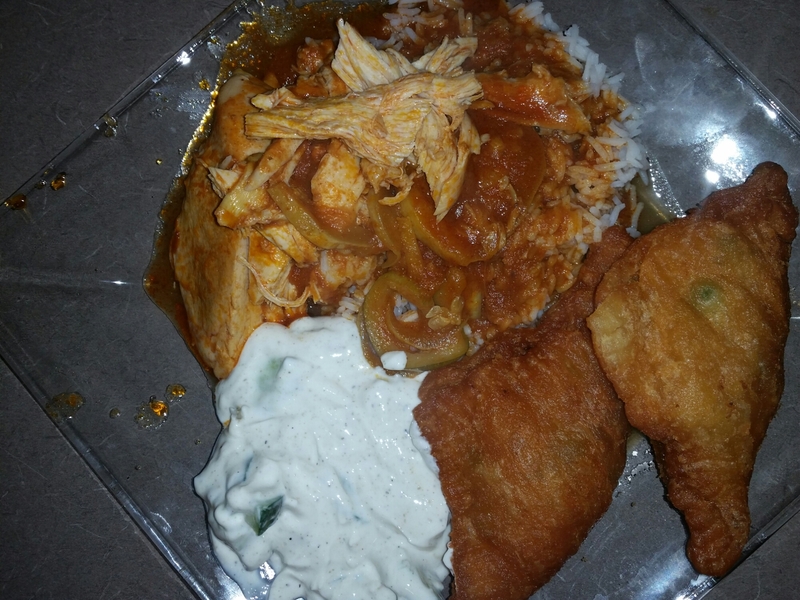 First up, we have the Red Indian Chicken Curry with Rice. Now, this may not be a staple we do a lot, due to indian curry is very greasy, and I don’t like cooking with a lot of grease. 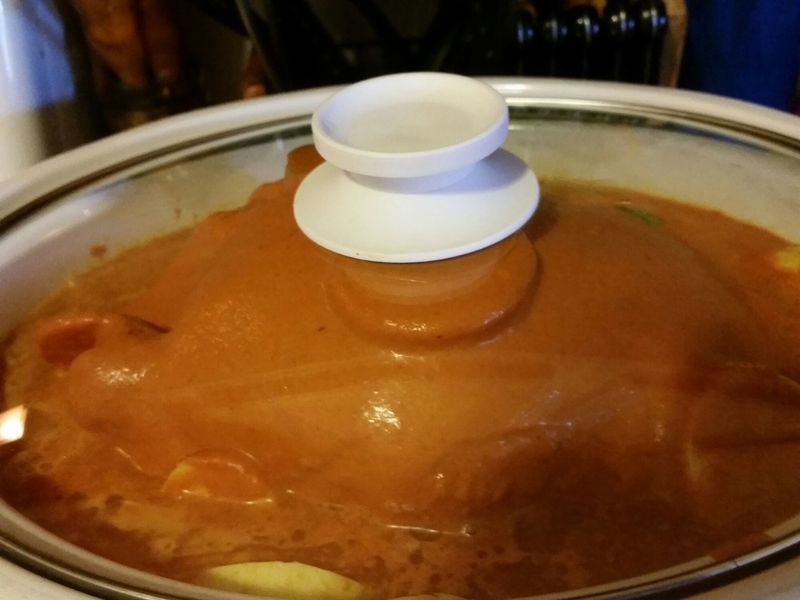 In any event, I figured out a way to cook a whole chicken for the curry. Yes, I used my crock pot. Now, I know I’m wearing out my crock pot, but it’s so easy to use, and clean up. It’s a staple during the school year since we have so many activities, appointments, and meetings. I throw it together, and walk away. In this case, I made my curry sauce from scratch, and added zucchini for a veggie. Using coconut milk, chicken broth, curry paste and indian spices, I blended the sauce in my blender, and poured it over the chicken. 6 hours later we were done! We next have cucumber yogurt sauce. I love this stuff anytime I go out to a small Indian restaurant. I found out it wasn’t that hard to make at all. I made the mistake of not documenting the process of this, but it’s so easy. Chopped up cucumbers, yogurt, indian spices, sea salt, pepper, and lime juice. Mix and serve. Now I kept my yogurt close to freezing so when I made it, I could serve it immediately. If not, make early, and serve later. Here’s the fun part, and cheat of the dish! These are my samosas. Now, normally there is a special pastry dough you buy you buy to make these. I didn’t like the price. You can also make the dough yourself, but who got time for that when your kids are hungry, and your tv is calling. So what did I do? as you see, I bought dough sheets. as you see, I did things my way. 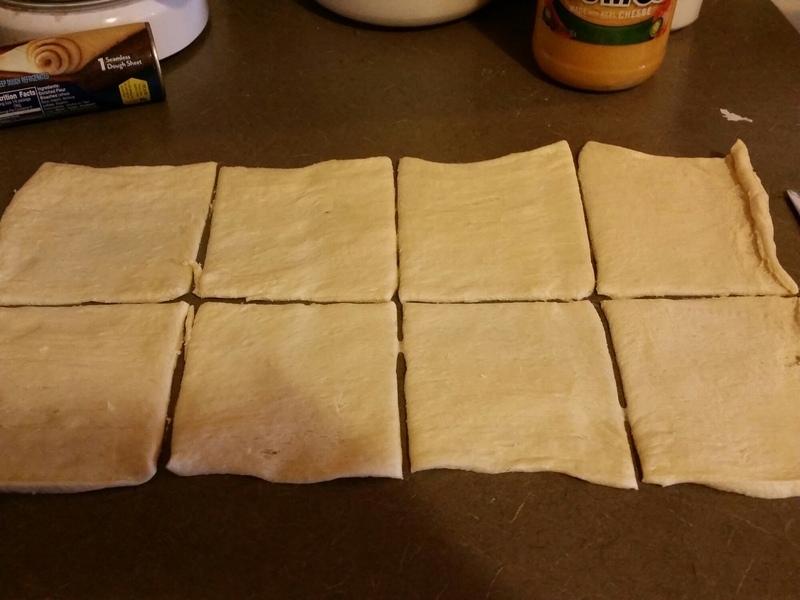 I first divided the dough into squares. you may want to put flour on the surface so it doesn’t stick to the counter, but you guys knew that. LOL. 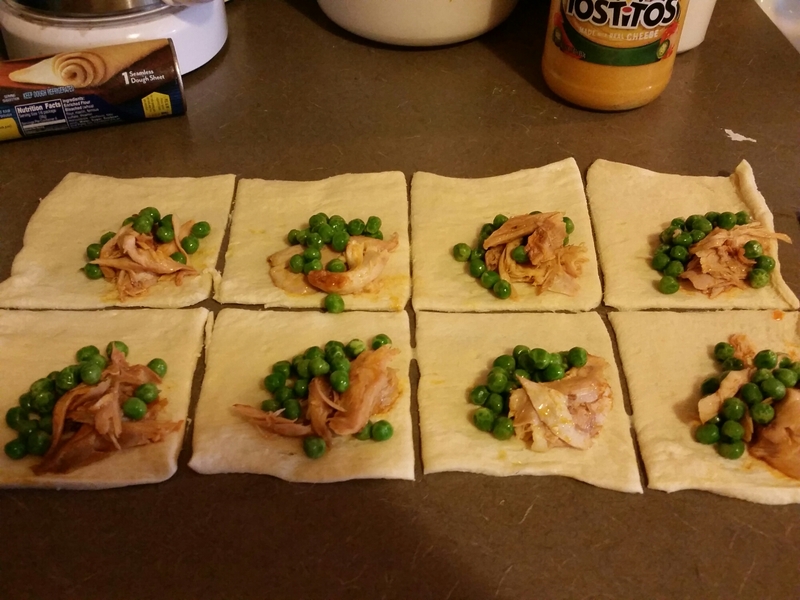 I then used the same chicken from the crock pot, and frozen peas as my filling. Now, in most cases, this is a vegetarian side dish, but what I found is that you can make them anyway you want. My first try was a dessert dish. You remember? Check the Facebook page if not. Yes, you have to get your hands dirty on these, but so worth it. Defrost the peas, pull the chicken of the bone(which at this point is very easy to do since completely cooked and soft), and full the samosas. Now the trick is to make sure you don’t over fill them. You still have to close and cook them. As you see, I’ve closed them up, and sealed them by pressing with a fork on the ends. These are bigger then normal, because my family isn’t average. LOL. Still worked out. You deep fry in oil. I prefer olive or canola oil, but any oil will work. You just really want to cook the dough. The inside is cooked, so I would estimate about 6 minutes on each side. 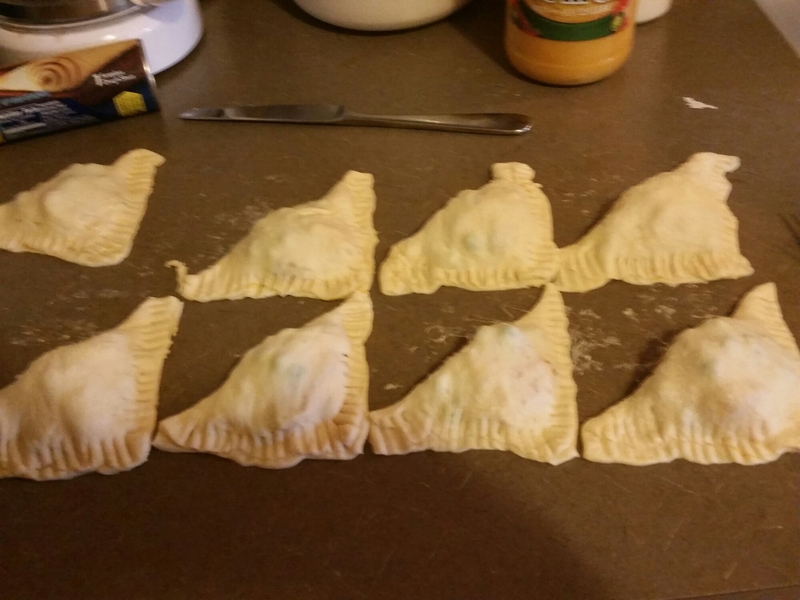 Just until golden brown on both sides. 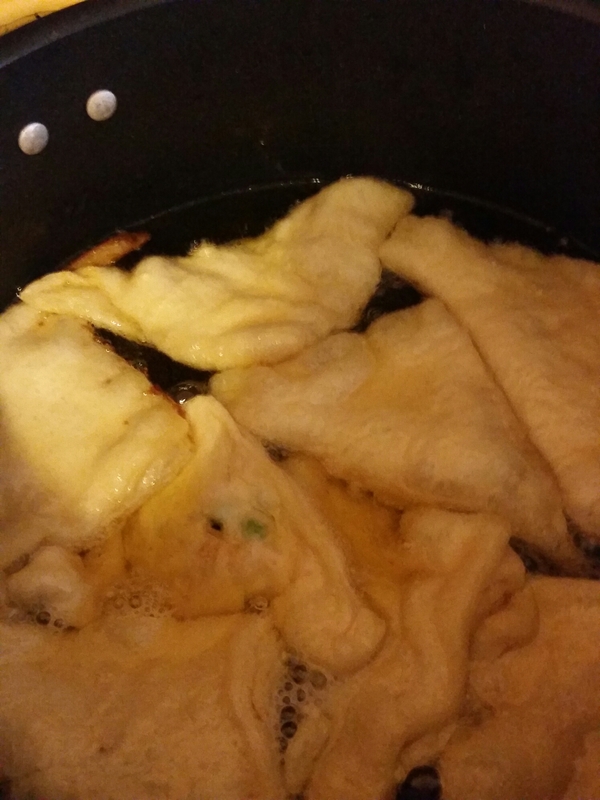 Strain out of the pan, and dry on paper towels. Real easy, right? Exactly. While I was letting my dinner cool before serving, I begin my dessert, Caramel Apple Banana Cobbler. Now it didn’t turn out the way I envision, but the taste was so awesome! 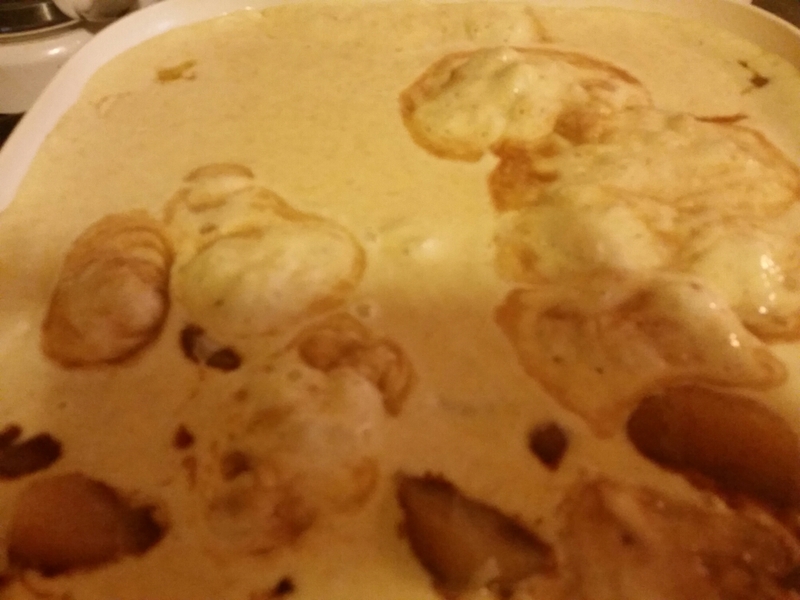 I used Apple pie filling, bananas, caramel sauce, and…..what for it….jiffy banana muffin mix. Layered it in the pan, and kept it moving. It was a little mushy for me, but the kids loved it with ice cream. The taste screamed fall. It was so great, my teenage son ate the rest for breakfast the next day. Yeah go figure. LOL. We have the finished product of dinner. Took a total of 35 mins to make. Kids loved it, we logged it as a keeper. Let me know what you think. Here, in the comments, or on the Facebook page!